Both Ira Glass and Malcolm Gladwell say today’s guest is their favorite storyteller. In his books and magazine articles, Lewis writes about sports, business, Wall Street, Silicon Valley, political campaigns, fatherhood. Stuff that matters to a lot of people. He’s smart and he has a sense of humor. 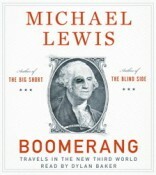 Lewis was a trader at Salomon Brothers before he wrote his first best-seller, LIAR’S POKER about the excesses of Wall Street during the 1980s. He continues to write about that world with his last two books, a column for Bloomberg, and articles in Vanity Fair. 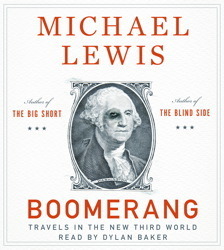 His newest book BOOMERANG: Travels in the New Third World is made up of articles originally published in Vanity Fair and picks up where 2010’s THE BIG SHORT left off. What happens after the meltdown of 07-08? Governments are the focus of this book. Mostly because they have taken on the bad debts of the too big to fail banks, so now they are themselves at risk. Now politics and culture become much more important as to how they will deal with that risk. Then there’s the story of California which as a state ran up unsustainable debts during a series of bubbles and can’t raise the taxes to pay for them. We’ll also talk about the twisted path taken to get MONEYBALL into theatres. The film based on his 2003 book is now a popular and critical success. MICHAEL LEWIS received a BA in art history from Princeton University and a Masters in economics from the London School of Economics. He contributes to bloomberg.com and Vanity Fair. His other books include The Blind Side, Panic, The New New Thing, and Home Game.